Thanks to the local City Idiot for this gem. Since i am often the DD – “designated driver” verses the luckier DD – “designated drunk”, I have to find a non-alcoholic beverage to consume while out at the clubs, bars, restaurants and parties. GOLD RUNNING THRU YOUR VEINS! So what’s better than tiger blood juice and a perfect drink for St Patrick’s Day? why, Lucky Irish Gem Juice! Careful how you say that. Don’t let drunk friends order it as if they’re slurring their speech it could sound like you’re asking for Jim Juice, aka Jim Jones Blue Kool-Aid suicide drink. Just remember Green Good. Blue Bad. Simple alliteration memory jogger there. GG good, BB bad. This drink can pass as non-alcoholic and safe for the non-idiots to drink who are the chosen ones to take their village idiot and city idiot buddies home from their favorite Irish Pub this St Paddy’s day. An excellent choice for those who choose not to imbibe the green beer monster. Bitters – i like the taste – it really amps up the ginger ale. Bitters does have alcohol but it’s like the equivalent of adding vanilla extract to a drink. A few drops aren’t going to do anything to your sobriety. Here’s a few BITTERS I like to use. Chloroxygen – 4 to 10 drops will do the trick depending on how ‘healthy and energetic’ you want to make the drink. REGULAR Chloroxygen or MINT Chloroxygen can be used depending on your preference. 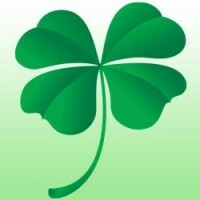 to get your Lucky Leprechaun Magic Elixir, aka CHLOROXYGEN today. THE LUCKY IRISH LEPRACHAUN GRASS is actually CHLOROXYGEN chloropyll supplement – great for natural energy boost and great for solving and avoiding altitude sickness / acclimating yourself to high altitude especially if you are like me and live most of the time near sea level. Regarding the video – it’s my interpretation of a city idiot – urban version of the Village idiot. It’s not polished, predictable, professional, etc. and it’s not supposed to be. He’s an IDIOT, duh. It’s a bit off, stupid, and just a little out there…. although as with the special idiot savant variety, there’s always a little bit of wisdom in older idiots – they are most likely the smartest of the bunch as they are still alive.
. . . and yes, i AM Irish but pretty far removed from the homeland – ancestors bailed out of the Blarney ages ago. I wanted to add an update on the benefits of the supplement ChlorOxygen. First off, what the heck is Chlorophyll? Chlorophyll is the green pigment in plants that harnesses the sun’s energy in photosynthesis. Chlorophyll performs metabolic functions in plants such as respiration and growth. OK, so why would I, who am NOT a plant, want to take it? Alleviate suffering from high altitude sickness naturally and FAST! Symptoms of altitude sicknes include shortness of breath, headache, disorientation, nausea. Desire to increase red blood cell oxygenation – explains why it works so good on relieving altitude sickness. 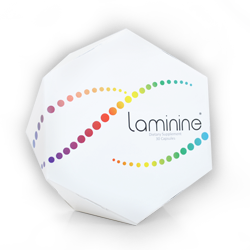 You’d like more life energy from a natural source that’s not caffeine or some other stimulant. I think of ChlorOxygen as INSTANT ALTITUDE ACCLIMATION in a bottle – Just Add Water! SO WHAT’s the best brand to take and where do I buy it? 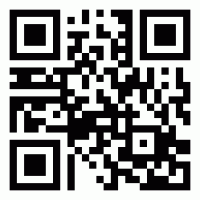 Remember to use code IHE882 to save $5.00 to $10.00 off your first order! Each ounce of Herb’s Etc. Chlorophyll Concentrate contains as much Chlorophyll as one or two 16 ounce bottles of other brands. Each ounce contains approximately 2,950 milligrams of Chlorophyll. 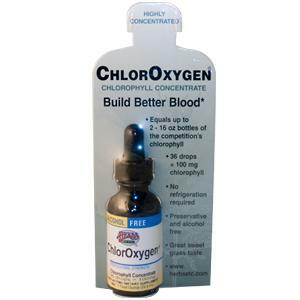 What makes ChlorOxygen Chlorophyll Concentrate such an awesome product? It is the best tasting chlorophyll on the market. More consumers choose ChlorOxygen for its mild yet tasty sweet grass taste over other chlorophyll brands. It is preservative-free and alcohol-free. Since ChlorOxygen is low in water, it does not need preservatives like other chlorophyll products. It is also alcohol-free. It is the only chlorophyll that doesn’t require refrigeration. ChlorOxygen is the only liquid chlorophyll on the market that doesn’t require refrigeration, which makes it way convenient. This is very helpful especially when traveling. ChlorOxygen is highly concentrated. It takes up to two 16 oz. bottles of the competition’s chlorophyll to equal a one ounce bottle of Chloroxygen. So you know you’re getting excellent value for your money with ChlorOxygen Chlorophyll Concentrate. SUGGESTED Use: Each 36-drop dose delivers 100 milligrams of Chlorophyll Concentrate. Take 18-36 drops twice a day in 8 ounces of water. Caution: Dark green stools may occur. I have found this to be true when taking it for the first time or when I haven’t taken any in a while and consuming the maximum daily suggested amount. However, the body seems to acclimate to this after a day or two and that side effect tends to diminish. I first discovered this product while visiting Santa Fe, New Mexico for the first time. Coming from sea level in Florida to 7000 feet in the mountains didn’t seem like a big deal immediately. Arriving in the AM and hitting the ground running, it didn’t hit me or my friend until the afternoon. Shortness of breath, headache, nausea and the feeling she was going to pass out was my friend’s reaction. I was mainly just a little winded and had a mild headache. We were both feeling the effects of high altitude sickness due to less oxygen in the air than we were accustomed to. Long story short, we were introduced to Chloroxygen at a local health food store and it was a life saver becoming an instant new favorite in my supplemental arsenal. An added benefit that has me using the stuff daily even in Florida is the energy boost it gives me. It’s a great alternative to energy drinks if you’re like me and don’t care for them. Unlike coffee or other caffeinated beverages, the chloroxygen gives me a nice consistent boost in energy level and alertness. You should be able to find Chloroxygen at your local health food store, but I have found iHerb.com to be a better deal all around. WHY iHerb.com? If you are planning on a trip to the mountains for snow boarding, hiking or skiing or simple traveling to a high elevation from a low one – like Florida – and you want to acclimate instantly to the higher elevation, Chloroxygen is the ticket. For me, I would use the old Amex phrase, “Don’t leave home without it.” Even if I’m not going to the mountains, bringing a bottle of chloroxygen with me to give me energy when traveling is a must. 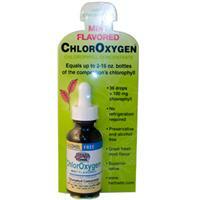 Chloroxygen offers 3 ways to take it: it comes in liquid drop form both regular and mint as well as capsules. It is alcohol and preservative free and doesn’t require refrigeration. More pluses in my book! Made from stinging nettle leaves, just 36 drops in 8 to 16 oz of water or liquid gives you 100mg of chlorophyll. The one ounce bottle has about 66 servings at 18 drops per serving. 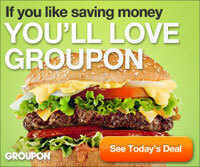 The bottle is about $10 bucks @ iHerb.com and with the coupon code IHE882, you save another $5.00. Store prices run around 12-15 dollars by comparison. If you add it to water, it looks really cool – a transparent deep green color. It can get things moving if you are suffering from constipation. Your poop will tend to appear darker and even green, especially when you first start taking it. My cats seem to like their drinking water with a few drops put in their water (like 5 or 6, not too many). Being house cats I figure it’s a good way for them to get their greens safely and it’s easier and cheaper than kitty grass. With the Winter season approaching and snow skiing vacations on many people’s list, this is a great time to tell everyone about a most wonderful discovery of a natural treatment for avoiding high altitude sickness. Heck, this is painless adjustment to high altitude in a bottle. 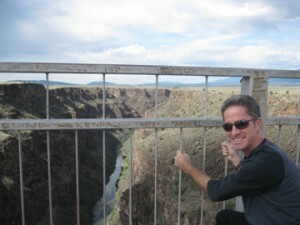 On a recent trip this summer out to Santa Fe and Taos, my friend and I experienced the effects of high altitude on our bodies as we were coming from sea level in Florida which we are accustomed to. At 6000 to 7000 feet above sea level, I’m told the oxygen levels are about 20% less than at sea level. Doesn’t sound like much, but it can get to you in the form of shortness of breath, headaches and nausea and worse. The change in altitude affects the pressure on the kidneys and fluid buildup in the lungs and brain. To make up for the decrease in oxygen, the body needs a few days to acclimate by increasing red blood cells which are your body’s oxygen transporters. The first day we are hitting the ground running around Santa Fe feeling good. Gorgeous weather and tons of stuff to see are distracting us from thinking about the change in altitude. But later in the day I notice I feel a little winded and my friend is faring much worse. She feels weak and nauseous and has trouble catching a breath. Concerned, we call a pharmacy to find out we are suffering from altitude sickness and my friend probably needs diuretics. Not ones for popping pills, we search to see if there are any oxygen bars in town. We find one but it’s closed. We consider homeopathic remedies and stop in a Whole Foods market. After explaining the situation, an employee leads my friend straight to a bottle of green stuff. I am a little skeptical of this being some sort of miracle elixir, but I figure it can’t hurt. I doubt it’s a placebo effect, but my friend and I can both personally attest that everything the label says is true. My friend wastes no time and grabs a bottle of water in the store and mixes up the concoction right there and starts drinking it. It turns the water a dark green color. As for the taste, they say it has a mild grassy flavor. It also comes in a mint flavored version. Personally, I like the taste and find it VERY mild… If you’ve ever had a shot of wheat grass, I can tell you this is NOTHING like that. I find wheat grass hard to drink as it’s soooo strong. This stuff isn’t. I am amazed at how quickly it works. My friend starts feeling a bit better within minutes and before the day is through, she is good to go. We both end up drinking the stuff the rest of the time we are in New Mexico. I swear it gives us a nice energy boost too – and not a harsh ‘wired’ one like mass marketed energy drinks can do. Along with regular water, it makes it very easy to stay properly hydrated the whole time we are there. We both like the benefits so much that we even use it daily back in Florida. We share the tip with everyone we meet too. I have to warn you, we did experience one of the ‘side effects’ too – green poo which smelled like grass fed cow variety. This seems to go away after you’ve been taking it for a while and your body adjusts to it. I really like that ChlorOxygen doesn’t require refrigeration and has no icky preservatives. At about $10 for a 1oz bottle [60 18 drop servings], it’s a very cheap solution to solving the problem of altitude sickness. ChlorOxygen, don’t leave for your mountain vacation without it!